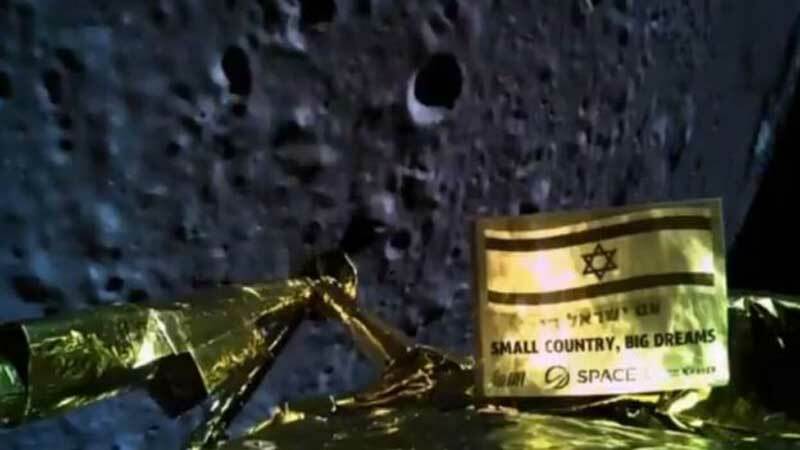 The Israeli spacecraft - called Beresheet - attempted a soft landing, but suffered technical problems on its descent to the Moon's surface. "We didn't make it, but we definitely tried," said project originator and major backer Morris Kahn. Prime Minister Benjamin Netanyahu, watching from the control room near Tel Aviv, said: "If at first you don't succeed, you try again." Tensions were high in the command centre as communications were lost before Opher Doron, the general manager of Israel Aerospace Indurstries' space division, announced there had been a failure in the spacecraft. "We unfortunately have not managed to land successfully," he said.The audience outside had been through a turbulent journey themselves as they watched the first part of the landing go to plan. "We are resetting the spacecraft to try to enable the engine," he said. Dr Kimberly Cartier, an astronomer and science news reporter, tweeted that she was "sad about how #Beresheet ended" but "proud of the entire @TeamSpaceIL".Beresheet, which is Hebrew for "in the beginning", was a joint project between SpaceIL, a privately funded Israeli non-profit organisation, and Israel Aerospace Industries. Its journey took it on a series of ever-widening orbits around the Earth, before being captured by the Moon's gravity and moving into lunar orbit on 4th April.The average distance to the Moon is 380,000km (240,000 miles) - Beresheet travelled more than 15 times that distance. And the main thing driving this was cost. Sharing the ride into space significantly reduced its launch costs - but it meant the spacecraft had to take a more convoluted route.How hard was it to land? Before the landing, Rob Westcott, senior propulsion engineer at Nammo, said "We've never used an engine in this kind of application before". He said the big challenge would be "the fact that the engine is going to have to be switched on and get very hot, then switched off for a short period of time when all that heat is remaining in its thermal mass, and then fired up again, very accurately and very precisely such that it slows the craft down and lands very softly on the surface on the Moon." Its first job was to use its high resolution cameras to take some photos - including a selfie - which it did manage before the crash. It was then going to measure the magnetic field of the spot it landed in, an area known as Mare Serenitatis.Monica Grady, professor of planetary and space science at Open University, said it would be "looking at the landing site really closely". This would help "work out how the magnetic measurements of the Moon fit in with the geology and geography of the Moon, which is really important to understand how the Moon formed". Temperatures on the Moon are extreme, and as the Sun rose the spacecraft would have been unlikely to survive the heat.How significant was this mission? The former Soviet Union achieved the first soft landing with its spacecraft Luna 9 in 1966. Nasa followed this by getting the first humans to the Moon in 1969. Then, China's Change-4 spacecraft touched down on the far-side of the Moon earlier this year. But it was the low-price tag - and the fact that the mission was not funded by a major space agency - that was significant.Beresheet was not alone in pursuing low-cost lunar exploration. Both Nasa and Esa have also announced their intention to use commercial landers to deliver scientific payloads to the lunar surface.BBC.